Members of the WKU Habitat for Humanity Campus Chapter will be spending the first week of their winter break in Oklahoma City, Oklahoma. 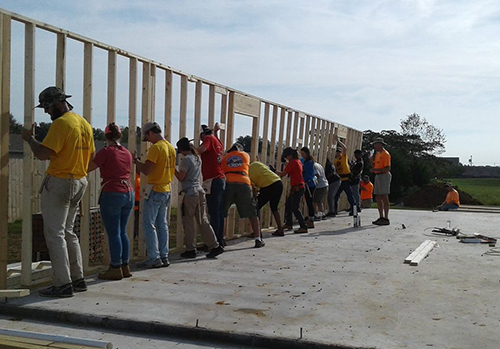 The WKU group will be working Dec. 15-22 on new construction and renovation projects with Central Oklahoma Habitat for Humanity as part of Habitat’s efforts to eliminate substandard housing. The group also will visit the Oklahoma City National Memorial and Museum. Participants in the trip include Bryan Reaka, chapter advisor and faculty member in WKU’s School of Engineering and Applied Sciences; Mazin Al-Abri of Bowling Green, a freshman Civil Engineering major; Caleb Harter of St. Louis, Missouri, a sophomore Manufacturing Engineering Technology major; Chelsea Smith of Somerset, a senior Biology major; Dominic Castlen of Lexington, a senior Accounting major; Kayla Austin of Utica, a sophomore Elementary Education major; and Nicholas Ernst of Belleville, Illinois, a senior Physics major at Missouri University of Science and Technology.